In describing the Santa Rita Hills region to California natives, I begin with its between the Anderson Split Pea Soup restaurant in Buellton and the beach in Lompoc.” I also add that it is the north side of Point Conception, the only east-west coastal mountain range in California. The vineyards use heat, wind, fog, and soil to produce Pinot Noir and cool-climate Chardonnay and compete with any region in the world. Many of the top winemakers were present, but there were enough new unearthings to make it fun and unique. The Santa Rita Hills appellation is mostly known through its vineyards whose grapes are outsourced to wineries up through the central coast. 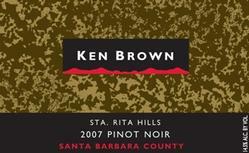 Ken Brown Cellars, since 2003, has earned a reputation for producing small lot Pinot Noir from top SRH vineyards like Clos Pepe, Sanford and Benedict and Rio Vista. The Ken Brown Cellars Santa Rita Hills Pinot Noir 2007 ($38), from multiple vineyards had soft fruits flavors with nice hints of vanilla while the single-vineyard Ken Brown Cellars Clos Pepe Vineyard Pinot Noir 2007 ($50) had much more depth with a nice spice on the finish. 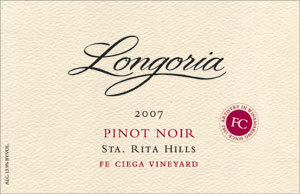 The Richard Longoria “Fe Ciega Vineyard” Pinot Noir is, vintage to vintage, one of the finest from the appellation. However, the first pour was the 2007 Richard Longoria “Lovely Rita” Pinot Noir ($32), a soft, fruit-forward wine from the Fe Ciega and Rancho Santa Rosa vineyards. Awarded 90 points by Wine Spectator, “Lovely Rita” is an affordable, very accessible wine that can stand on its own, but lacks the age of their flagship release. The 2007 Richard Longoria “Fe Ciega Vineyard” Pinot Noir ($50) is a classically elegant, medium-bodied wine with an herbal spice interacting with the dried cherries and vanilla flavor throughout. Influenced by 35% new French oak, the $50 price tag of the 2007 is softened by its 93-point rating. My “bolt from the blue” of the tasting was the 2006 Richard Longoria “Clover Creek Vineyard” Tempranillo ($36), the Spanish grape that thrives in the Roija region, between Barcelona and Bilbao. Atypical to this area, Longoria has found the warmer Santa Ynez Valley as a near ideal terrior for his Tempranillo vines. His wine is rich in texture, bouquet and flavors with a soft earthiness throughout. Aside from fine restaurants in the area, all Longoria wines are available at their Los Olivos village tasting room. About a mile and a half from the 101, west along Highway 246, is the Hitching Post Restaurant, made famous by the film, “Sideways”. They are known for fine food and a fantastic wine list, but few are aware that they produce their own line of wines. Chef/owner Frank Ostini and friend Gray Hartley turned a hobby, some thirty years ago, into an annual search for high-end Pinot Noir from some of the celebrated vineyards in the Santa Rita Hills appellation. This day, they were pouring single-vineyard Pinot’s from the Cargasacchi and Fiddlestix Vineyards, both well represented throughout the event. The Cargassachi Vineyard is more westerly than any other in the appellation, designating it “the coolest of the cool.” The Hitching Post “Cargassachi Vineyard” Santa Rita Hills Pinot Noir 2006 ($42) expressed well-balanced flavors with hints of raspberry, benefiting from the softness of the wine. Fiddlestix Vineyard, along Santa Rosa road near the Fe Ciega Vineyard supplied the grapes for the Hitching Post “Fiddlestix Vineyard” Santa Rita Hills Pinot Noir 2006 ($42), influenced by new oak, a rich, full-bodied Pinot that can even get better in time. New discoveries are always the best “takeaways” from tasting events, especially taking note of a specific wine like the 2007 Demetria Estate “Eighteen” Chardonnay Santa Rita Hills ($45). Barrel-aged for 22 months in primarily new French oak, another nine months in the bottle, the “Eighteen” delivers complex bouquets and flavors, floral hints throughout in a rich, creamy package that delights the palate. It is no wonder that most of my favorite California chardonnay hails from this appellation. With a deep garnet color and bouquet like a bowl of fresh berries, the 2007 Demetria Estate Pinot Noir Santa Rita Hills ($40) adds hints of vanilla and significant oak influence to an intricate flavor profile. Demetria Estate also produces white and red Rhone-style blends, mainly in the Santa Ynez Valley. They re worthy of inclusion in any wine enthusiasts “tickler” file. Kathy Joseph, owner/winemaker of Fiddlehead Cellars, is one of my favorite people from this region and her Fiddlehead “Goosebury” Sauvignon Blanc is, hands down, my favorite of the varietal. The three Santa Ynez Valley Sauvignon Blancs were left at her tasting room, but at least she was present with three consistently high-end Pinot Noir, two from the Santa Rita Hills and one from Oregon. The Fiddlehead Cellars “728” Pinot Noir Santa Rita Hills 2007 ($42), named after the mile marker at the entrance to Fiddlestix Vineyard, is Kathy’s first Pinot, full of black cherry, plum flavors and a bit of black pepper. 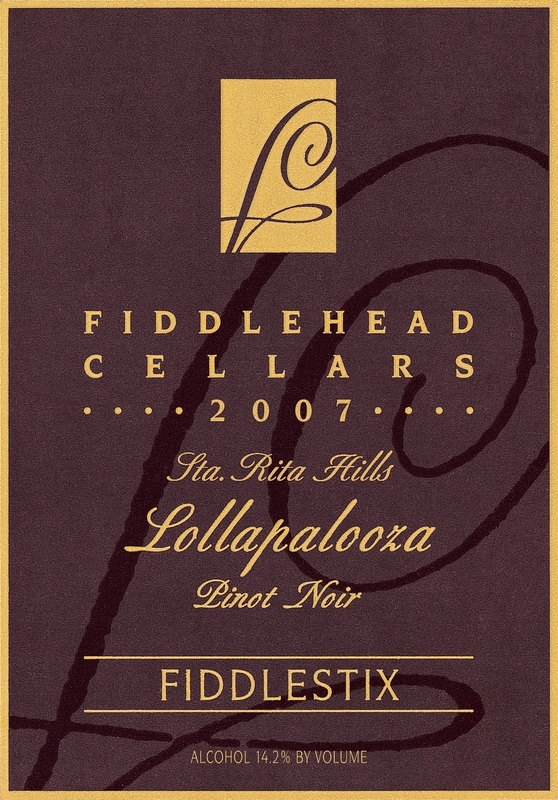 Once the wines are aged for 18 months, the most elegant barrels, silky and rich, are selected for the Fiddlehead Cellars “Lalapalooza” Pinot Noir Santa Rita Hills ($75), her premium wine. A soft minerality accompanies rich dark cherry and berry to form an elegant structure. My familiarity with this wine never interferes with my anticipation of great flavors. The owners of two esteemed vineyards, Cargasacchi and Clos Pepe, were in attendance, pitching their own Pinot Noir releases. Both vineyards can “sell” a bottle of wine, so logic tells us that the terrior will continue to influence their own wines. 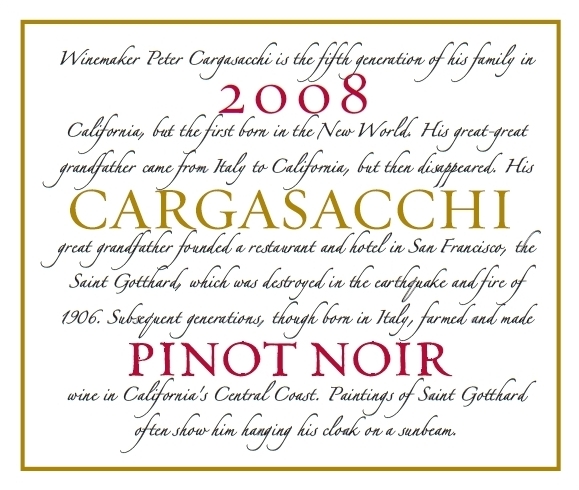 Cargasacchi poured vintages ’07 and ’08 of the Cargasacchi Vineyards Pinot Noir Santa Rita Hills, both fruit forward with long finishes. In my opinion, the ’08 had more depth and a wonderful bouquet. I would recommend this wine to someone who wants to discover the varietal. Clos Pepe Vineyards creates Pinot Noir that shows restraint, believing that too much emphasis is placed on the highly concentrated, jammy wines. That being said, the vintage ’07 and ’09 Clos Pepe Vineyards Pinot Noir Santa Rita Hills both walk the fine line between elegance and masculinity, expressing nice traditional bouquet and flavor. Years ago, Pinot Noir was intended for consumption within a year of release. Today, California’s bold Pinot’s are more tannic and can improve over years. Proving this point, the winemaker opened a 2001 Cargasacchi Vineyards Pinot Noir Santa Rita Hills, expressing exceptional balance and integrated flavors, surprising for a decade old release. My last stop resulted in an interesting conversation with Deborah Hall, owner/winemaker at Gypsy Canyon Vineyards and Winery whose wines have been highly recognized by many periodicals. Generating under 350 total cases, her Pinot Noir is big, bold and ripe for aging while her other release, a dessert wine is steeped in California history. Deborah’s Pinot Noir, in the opinion of many, is “not for everyone.” She is said to create very individual wines, usually bold, tannic, clearly developing with time. However, consensus is that her 2008 Gypsy Canyon “Trois” SRH Pinot Noir ($95) has reached a new plateau in complex flavors, balance and texture. The traditional plum, dark berry flavors are smokey and earthy, yet perfumed. Be prepared to give it some time. Originally planted by the Franciscans as they established California missions, the fortified dessert wine, Gypsy Canyon Ancient Vines “Angelica” ($135) is a pure re-creation of the original, using Mission grapes from the same vineyard, overgrown and hidden for a century. Expensive, but a must for those interested in California history, wine and good taste. More like port than dessert wine, the sweetness is offset by a rich, creamy caramel flavor. There is a great story woven into the fabric of this winery, one that would invite further exploration. Events such as the Palate Food and Wine tasting opens new doors and is a reminder that world-class wines are produced less than an hour north of Santa Barbara. Vineyards and charming villages like Los Olivos expose another side of the region. With a plethora of good restaurants, wineries and inns, it’s your next weekend get-a-way waiting to happen. Here are a few recommendations among a multitude of options. Restaurants: Los Olivos Cafe, Patrick’s Side Street Cafe, The Ballard Inn Restaurant, The Hitching Post. This entry was posted on Friday, June 24th, 2011 at 4:00 am	and posted in Wine. You can follow any responses to this entry through the RSS 2.0 feed.